The Yankees’ game plan for tomorrow night in Houston is simple: get to Justin Verlander early, get into the overworked and underperforming Houston bullpen early, and hope Luis Severino is at his best. If all goes according to plan, much easier said than done I must add, then the Yankees will have booked their ticket to the Fall Classic for the first time in eight years. Watching Keuchel and Verlander cut through the Yankees lineup like a hot knife through butter in games one and two in Houston last week, I have to admit I was concerned. The offense looked lifeless, out of sync, and guessing at every turn. They took hittable pitches in the middle of the strike zone, they swung at pitches well out of reach and the home plate umpires weren’t doing them any favors either. The writing was on the wall: 2017 was a feel good story for the New York Yankees, but they had finally met their match. The Houston Astros were the better team and they were well on their way to winning their second ever - and first in the American League - pennant. The Baby Bombers put on one hell of a show in overcoming a two-games-to-none deficit to the Cleveland Indians, but they were still a year or two away, and just being in the League Championship Series ahead of schedule would provide invaluable experience that would pay off in the future. Boy was I wrong. 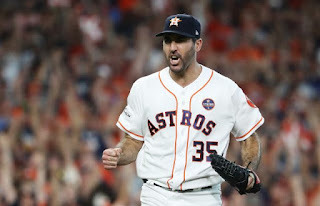 Five days after game six starter Justin Verlander completely baffled the Yankees in game two to the tune of five hits, one walk and 13 strikeouts in a complete game win that left the Yankees in a familiar 0-2 hole, the Yankees are on a flight back to Houston, this time up three-games-to-two. A date with destiny awaits tomorrow night in a rematch against the man that so easily dominated them last Saturday afternoon. This one is the most obvious - the fastest way to get a pitcher out of the game is to make him throw a lot of pitches. To start game two, Brett Gardner worked an eight pitch at-bat in which he ultimately struck out. The Yankees were well on their way...until they weren’t. Judge struck out on four pitches and Didi popped out on the second pitch he saw. Through four innings, Verlander was at just 53. He was able to record his next 11 outs on just 45 pitches following Gardner’s at-bat. They did battle in the middle innings to get Verlander’s pitch count up to 97 through seven, but Hinch instead opted to stick with his ace in a one-one tie, with Verlander ultimately completing the full nine innings having thrown 124 pitches. Verlander was far from perfect last Saturday and the New York bats will tell you the same. Aaron Judge and Gary Sanchez were still slumping. The designated hitter position had yet to yield a single hit all postseason. Starlin Castro lacked any sort of plate discipline. If you look back through the tape, Verlander left a decent amount of fastballs up and over the middle that were either taken for a strike, fouled off, or swung completely through. I would even go as far to say the same thing about Dallas Keuchel in game one, minus the velocity that Verlander offers, of course. The single biggest momentum-killer in this series for New York came in the top of the third inning of game two. With the score still tied at zero and Brett Gardner up with none on and two out, the Yankees’ left fielder ripped a ball into the right field corner that had extra bases written all over it. Gardner was thinking two but third base coach Joe Espada had other thoughts. He waved Gardner through second to third in an attempt to stretch his double into a triple. While it took a perfect relay from Josh Reddick to Carlos Correa to Alex Bregman for the tag, Gardner never should have ventured past second. The Yankees were able to scratch across a run in the fifth inning, but that was the last real scoring threat they had all game. 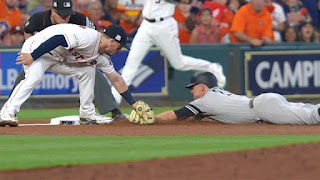 Espada’s decision to wave Gardner through to third took an RBI opportunity away from Aaron Judge who was on deck, and the Yankees never really seemed to grab any momentum the rest of the game, ultimately falling by the score of 2-1 on Correa’s walk-off RBI double. For the Yankees to have a chance at roughing up Verlander tomorrow, mistakes like these cannot be made. The Yankees can be aggressive in running against Brian McCann who has thrown out only 13% (8-for-62) of base stealers all season, but they cannot under any circumstances give away outs on the bases. Verlander in four elimination games: 1.48 ERA, 33K, 8 BB, .183 BA in 30 1/3 IP (WSG5 2006; LCSG5 2011; DSG5 2012; DSG5 2013). Per STATS LLC. If I'm being perfectly honest with myself, I think the Yankees will absolutely have to do their damage against Verlander. Based on his previous outing, his history of success in elimination games, and the fact that Houston Manager A.J. Hinch has little to no faith in his bullpen right now, we might be in for another end-to-end Justin Verlander outing. That's not to say Verlander will be unhittable again, however. The Yankees have already shocked the world twice this week, roaring back from a four run deficit in Game Four and then defeating their arch-rival in Game Five. 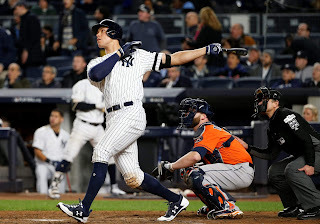 I think we're in for an ultra entertaining, ultra stressful, and even potentially historic night tomorrow, as the Yankees seek our their 41st American League crown, and a chance at capturing #28.